I hope you’re enjoying your Summer so far! I have been spending most of my time studying and working (I know, boooooo! ), but I have a couple of exciting things planned for this Summer, including a trip on the other side of the pond, and school will be over soon *squeals*. Beauty-wise, I have been diligently testing out a few new things (mostly makeup), so a new catch-up was definitely due. I hope you enjoy, and let me know if you have any questions! Also follow me on Snapchat for a little bit of food prep, makeup swatches, and unedited randomness. Snap name is genuineglow. Clarisonic Mia Fit. I think that I already mentioned this, maybe a while back ago, but I purchased two Clarisonic cleansing devices before, and returned them to the store. Not because they were defective or they didn’t work for my skin, but because both times I changed my mind. Honestly, I was scared to try them. 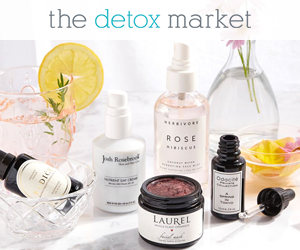 The reason is that my skin is very delicate and does not react well to intense massaging, scrubbing, physical exfoliation, or any harsh face masks. Clarisonic recently contacted me to ask me if I wanted to try this new cleansing device called Mia Fit* and told me that this device and the brush head that it comes with (called Radiance brush) were very gentle, so I decided to try it. Not only has my skin not freaked out, but I have actually been enjoying it, and every evening I genuinely look forward to using it. It makes my skin feel very well-cleansed and soft. I am under the impression the the texture of my skin may be looking better as well. I would like to write a more in depth review for it (I haven’t been using it long enough for that), so I plan to continue to use it and keep you posted. If you want to check it out, you can do so here. Alima Pure Pressed Eyeshadows. 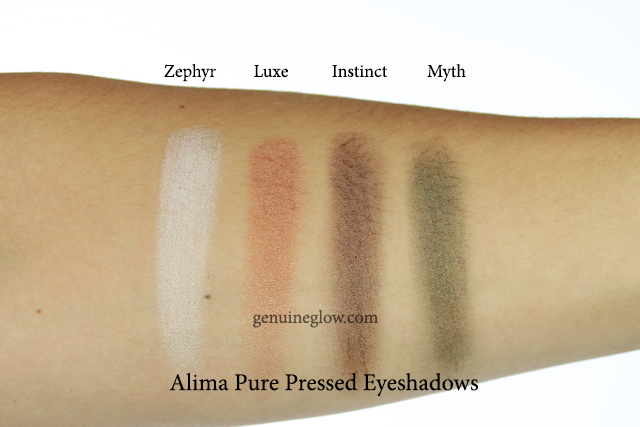 The newest launch from Alima Pure is pressed eyeshadows*. If you already were a fan of Alima Pure like me, then you, too, were probably hoping that they would make their eyeshadows in a pressed version. First off, the packaging is awesome. They can be purchased in an individual compact (with mirror) that is magneti(so the eyeshadow pan sticks to it), but can also be easily removed from it to be placed in a magnetic palette. You can also buy the refill-only, (available here) instead of the compact, and place it in a Z-palette. The size is generous, the colors I have tried are to-die-for, and the quality of the eyeshadow is excellent. They are soft to the touch, but not to the point that you pick up more product than needed, and they do not crumble when you dip in, whether you use fingers or brushes. They also blend beautifully. The colors I own have a luminous finish, but zero glitter/shimmer/weird particles, so even more mature ladies can wear them without drawing attention to wrinkles. It’s more like a soft iridescence. I am getting more colors for sure, and my first picks will be Icon and Mirage. I will post a full-review for them and show you some comparison with similar eyeshadows so you can get a better idea of the colors, in case you feel like you own similar colors already. But these definitely get my stamp of approval and I highly recommend them. I honestly can’t even pick a favorite shade because they’re all so good. You can find them here. Jane Iredale Bronzers. 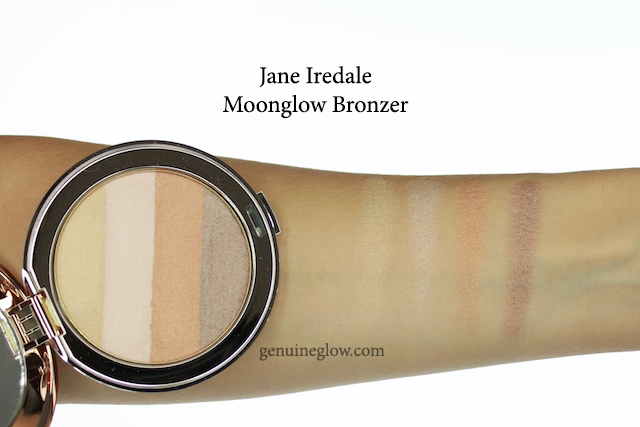 One of my most worn makeup products lately is definitely the Moonglow Bronzer from Jane Iredale. It is called a bronzer, but seems more like an illuminator. First off, it comes in a compact with 4 different colors which can be blended together or applied individually (even as eyeshadows, so you get some multitasking value as well). The reason why I love it is that it gives a beautiful, wearable sheen that looks like highlighter but is not too obvious, and the different colors that I can make lighter or darker as I please (depending on whether I am wearing blush or not/which color of blush I am wearing). So it is a versatile type of highlighter with a silky texture, and I think that it is one of the most beautiful, Summer appropriate makeup items that I have been using. It comes in three different shades. Moonglow is more suitable for golden-tones skin tones like mine, but they also have Rose Dawn for skin tones with pink undertones (pink and bronze colored stripes) and Sunbeam for skin tones with more neutral undertones (pink and copper colored stripes). You can find them here. Teri Miyahira Beauty Box*. My lovely fellow Youtuber Teri recently created a subscription beauty box that delivers beauty products created by her, every month. 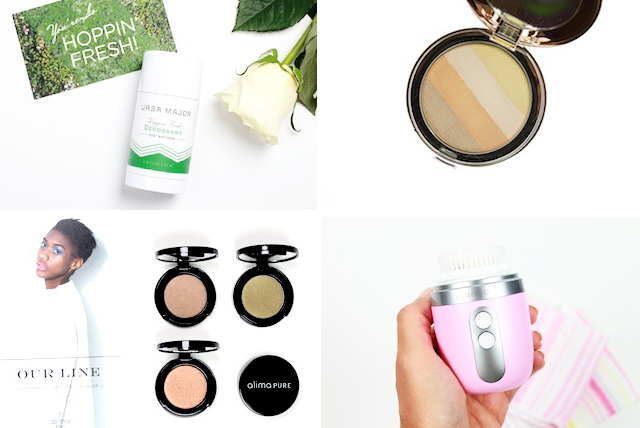 I had the chance to try some of the products and I have been very impressed with the makeup products. Unfortunately not all the products can be purchased individually, but I absolutely loved her Dew Drops Blush and Illuminator, which are liquid makeup products that feel incredibly light on the skin, but deliver beautiful color and luminosity. Hopefully more of those will come in future boxes. I also like the pressed blush in the color Hope (which you can purchase off the website); it is a warm, peachy color with a matte finish. The great thing about a beauty blogger/vlogger making products is that they know what we like and what we want and this is why her boxes have been fabulous. You can check it out here. Ursa Major Hoppin’ Fresh Deodorant. Another winning deodorant! If you still have not found a natural deodorant that you love, and especially if you have been frustrated with the too creamy/too crumbly/too hard consistency of most deodorants on the market, then this Ursa Major deodorant might be it! The texture is almost like a solid gel, so it glides effortlessly–no tugging, no crumbling, no creamy mess. It is just perfect. It works well to prevent bad odors. The scent is herbal. I initially thought it contained tea tree, but no–it’s a blend of other herbs (Rosemary, Peppermint, Grapefruit, Eucalyptus), so it smells fresh and clean. Most definitely unisex. As always, I like to point out that it contains baking soda, which some people are sensitive to, but I did the ultimate sensitivity test (for myself anyway) — I applied it after shaving, and I did not have any issues. If you are very sensitive to baking soda, however, it would be a good idea to get a little sample or purchase it from a store with a good return policy, just in case. You can find it here. Have a great week! I will have a new post+giveaway up here asap. Ciao!